Quick-FIT is a bootcamp style fitness class designed with the beginner in mind. Workouts will include a wide variety of easy-to-learn exercises, including cardio, strength training, and body-weight movements. That means you won’t be expected to lift heavy weights or perform intimidating exercises … In fact, our stress-relieving workouts are so fun, you may even forget that you’re working out at all! Our goal at Quick-FIT is to make fitness SAFE, FUN, and ACHIEVABLE for everyone, regardless of age, fitness level, or physical limitations! 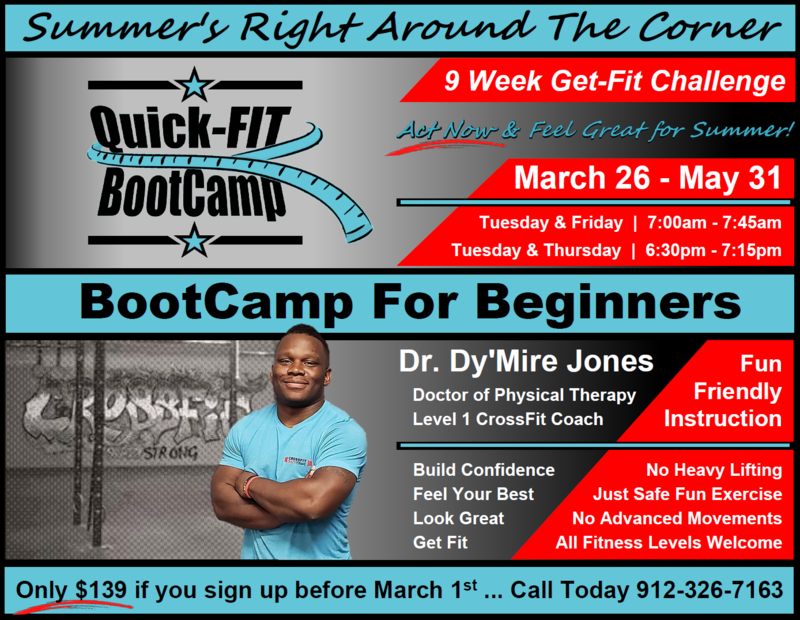 Dr. Dy’Mire Jones will lead the classes and create a Fun, Friendly, Welcoming environment that will have you looking forward to your next class. As a Doctor of Physical Therapy, Dy’Mire is more than your average Personal Trainer…He brings a wealth of knowledge that will allow you to overcome any past physical limitations that may have been keeping you away from the gym! So if you’ve been considering an exercise routine, but been afraid to pull the trigger, let Dr Dy’mire motivate you to get into the best shape of your life! Summer’s right around the corner, so register now for Quick-FIT! Start the process of toning up, losing weight, and building confidence so that you’ll be feeling great and looking great when summer arrives!